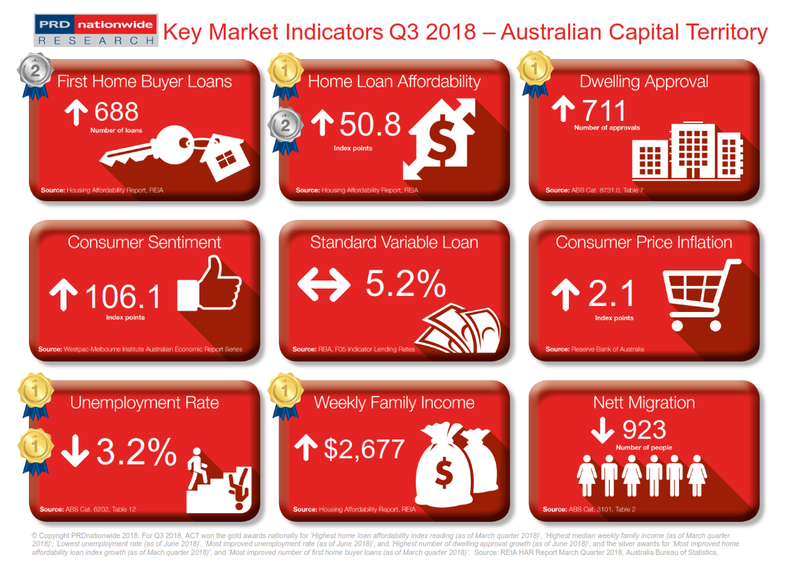 Australian Capital Territory is a leader in the market with the highest index reading for home loan affordability and most improved unemployment rate. Australian Capital Territory (ACT) has come to be one of the most affordable states in Australia, earning a gold award nationally in the highest home loan affordability index reading category (50.8 index points) and a silver award nationally in the most improved home loan affordability index growth category (2.2% growth). This is the second quarter in a row that the ACT has taken the above medals. Undeniably the above results are directly correlated to ACT also taking the gold award nationally in highest median weekly family income, at $2,677 per week in March quarter 2017. Property prices in ACT are still more affordable compared to Sydney and Melbourne, thus residents in ACT now have a higher ability to buy property. Furthermore, ACT takes out the gold award nationally in most improved unemployment rate, declining by -31.9% over the past 12 months to June 2018. ACT also takes out the gold award nationally for lowest unemployment rate, of 3.2% in June 2018, significantly lower than the Australian average of 5.4%. This further suggests that there are more people with the ability to purchase a property in the ACT. Combined with the above factor in median weekly family income, it is no surprise that the ACT takes out the silver award nationally in most improved number of first home buyer loans (80.6%), missing the gold award nationally to New South Wales (80.8%) by a mere 0.2%. As a flow on effect to the above phenomena is the increase in demand for property in ACT, which will be satisfied by the increase in dwellings approvals. ACT holds the gold award nationally for highest number of dwelling approval growth in Q3 2018, at 48.1% as of June 2018. The addition of stock will assist in keeping properties affordable, as the ACT should not be exposed to a supply shortage.